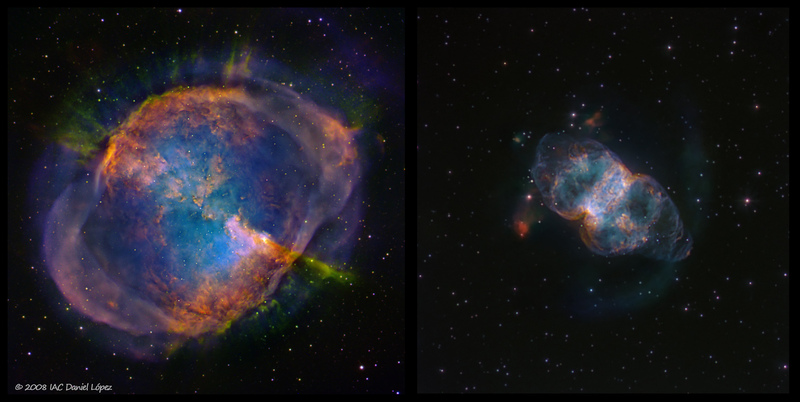 Explanation: These two nebulae are cataloged as M27 (left) and M76, popularly known as The Dumbbell and the Little Dumbbell. Not intended to indicate substandard mental prowess, their popular names refer to their similar, dumbbell or hourglass shapes. Both are planetary nebulae, gaseous shrouds cast off by dying sunlike stars, and are similar in physical size, at a light-year or so across. In each panel, the images were made at the same scale, so the apparent size difference is mostly because one is closer. Distance estimates suggest 1,200 light-years for the Dumbbell compared to 3,000 light-years or more for the Little Dumbell. These deep, narrow-band, false-color images show some remarkably complex structures in M27 and M76, highlighting emission from hydrogen, nitrogen, and oxygen atoms within the cosmic clouds.